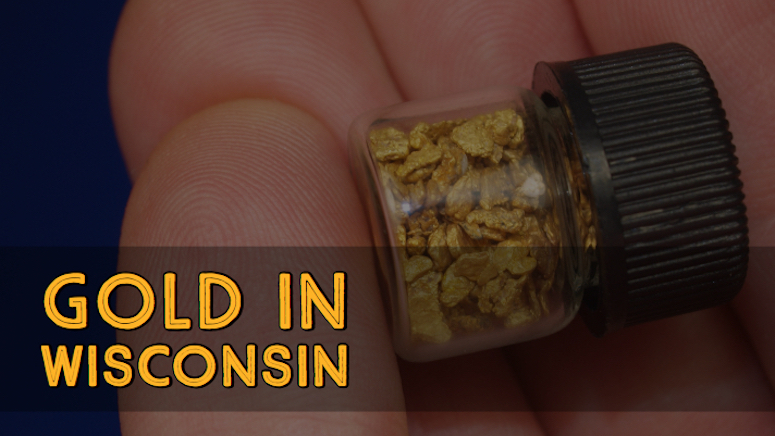 Wisconsin is a state that has long been known to yield minor results to small-scale prospectors in several different areas of the state. It is an interesting state as far as gold is concerned because of its known potential to produce the yellow metal. Let’s take a closer look at Wisconsin and its gold history and future. As is typical of the region in the upper Midwest where Wisconsin sits, there is little or no interest on the part of commercial mining companies to take on any big mining operations in the state. Most of the gold that has been found is in placer deposits scattered throughout the countryside found at the banks of rivers and streams. Small-scale prospectors have a history of success in the state with finding the very fine grained gold that these placer deposits yield; these fine textured bits of gold are referred to as what is commonly known as ‘flour gold’. Finding a nugget of even pea size would be a very rare occurrence indeed. Read: How Rare are Gold Nuggets? Glacial movements have been thought to have brought these gold deposits from as far away as Alberta, Canada into the area. The glaciers actually acted like a grinder on the gold to crush it into the small dust like particles that it is found in. This type of gold can be found in almost any waterway in the state but most significantly has been found on the shores of Lake Superior and around Plum Creek in the Pierce County area. There has actually been speculation of big lode deposits existing under the ground but the ore is of low quality and it would not be cost effective to get the gold out of the ground. Of course this could change if the price of gold ever went up dramatically, but with the current trend of gold prices this seems unlikely in the near future. As mentioned the most significant gold finds in the state were done in the Plum Creek area. The biggest of which took place from 1887 – 1890. This fine gold was found by means of sluicing and yielded a large amount of flour gold and some slightly larger size grains also. Once again this venture fizzled out because of the eventual lack of substantial gold finds and the tediousness of the work to extract the gold. As far as the future goes, there is an ambitious venture going on near the Town of Easton, which is located east of Wausau in the Marathon County area. The attraction there is what is known as a “reef” deposit with actual known gold reserves that could yield as much as 119,000 ounces of the yellow metal. The deposit was first discovered way back in 1970 but it was not until the recent spike in gold prices that anyone thought about seriously going after the gold. Of course there will be considerable costs in extracting these ores, and the future mining endeavors are still yet to be seen. So between the continued panning that often leads to finding small amounts of gold and the ore finds that will probably come up, Wisconsin has a chance to be very active when it comes to states that have a lot of gold activity going on.